BBA Aviation plc, the owner of Signature Flight Support, has announced that it has agreed terms for the proposed US$2.065bn acquisition of Landmark Aviation from affiliates of The Carlyle Group. Landmark operates a global network of 68 FBOs across the USA, as well as aircraft maintenance, aircraft management and charter businesses. The acquisition, which is subject to regulatory and shareholder approvals and expected to close in early 2016, represents a major expansion of Signature Flight Support’s network of 133 global FBO locations. Landmark’s aircraft maintenance locations will also supplement Signature’s existing MRO operations delivered through its Signature TECHNICAir and CSE Citation Centre brands. Landmark’s aircraft management and charter fleet numbers 110+ aircraft. 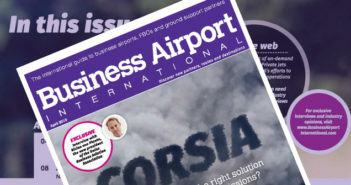 Simon Pryce, chief executive of BBA Aviation, said, “This is a transformational step in the continued execution of BBA Aviation’s strategy that is both strategically and financially compelling. It represents a unique opportunity to materially expand our global Signature FBO business and deepen our exposure to the attractive business and general aviation (B&GA) market with its structural growth drivers. “The acquisition would enable customers to benefit from an extension of Signature’s industry-leading service offering and its operational excellence across a much larger network of high-quality locations. Combining Signature and Landmark Aviation would also realize significant cost synergies as well substantial tax benefits.